Been awhile since I have experienced late night lightning, but I was awake and in luck tonight, Aug 28th, 2016. We had taken a trip to the Arkansas River valley in southern Colorado to buy Pueblo peppers and visit the state fair where my kids had participated at the State level in 4-H earlier in the week. After a fun but long day we came home and I started peeling the skins off of our many bushels of peppers; this usually goes well into the night! 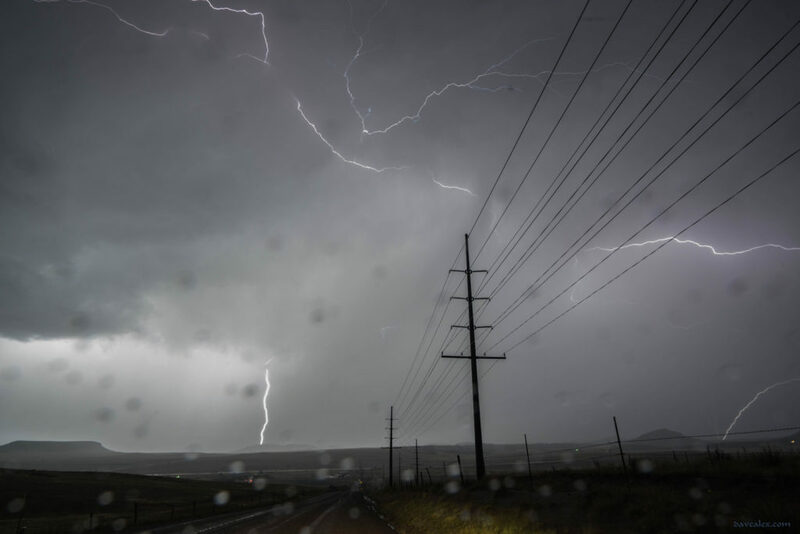 Just as I was finishing bushel #1, there were flashes in the sky; at first I thought it was a car going by but to my delight a storm was passing by to our south. The insects were having a symphony in the front yard and the only man-made noise was a train passing by a 1/2 mile or so away (lots of squeaks and metal on metal scrapes) so I recorded some of the ambience while enjoying it. 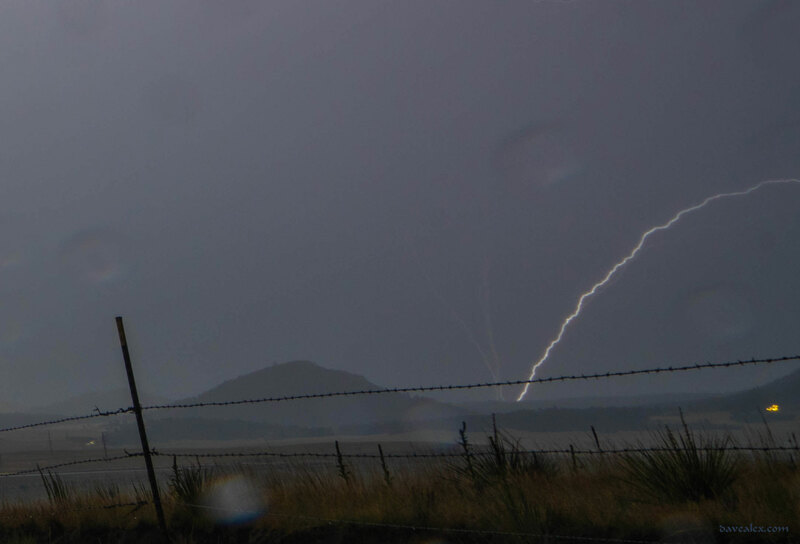 Meanwhile the lightning was becoming more frequent, so i jumped in the car and headed for vistas out of the trees. I ended up driving about 5 miles south of Larkspur and sat on top of a hill overlooking the Spruce Meadows Open Space at Greenland and watched the show. 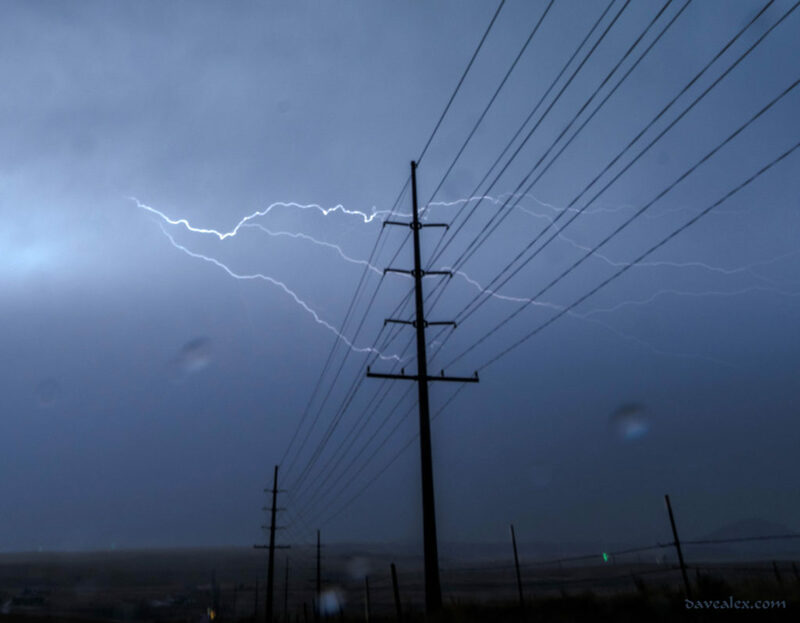 I enjoy taking pictures of lightning with power lines, and these were carrying a lot of electricity so I figured it would be perfect foreground for lightning shots. 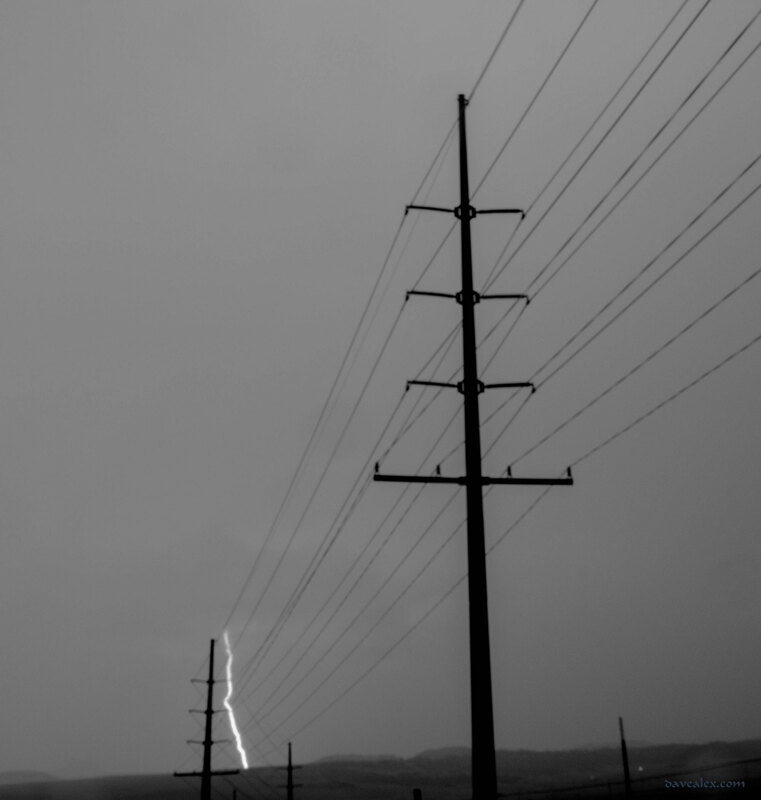 Given it was raining and the lightning was fairly close, I decided to shoot from within the truck. I have been getting better at holding the camera fairly steady with the iris open, these were 6 second shots at ISO 800, f/11, focus at infinity. I was using a wide angle lens. To remove the rain from the windshield I need to have the wipers on; sometimes there are drops in the shot but that goes with the territory; not much I can do about that given it is raining. Luckily the lightning is so quick and otherwise it is dark (no light) so most of the shots you don’t see the wipers. Then it is just a waiting game, reviewing the pictures to ensure the field of view is what is expected. Unfortunately the lightning was infrequent, about 90 seconds apart, so I got a lot of black pictures I had to delete later. As always, click on the photo for a larger size. Interesting placement of the bolt and the tower, I wish I could say it was planned, but nothing about that shot was planned; all luck…and being in the right place at the right time! Lots going on in this shot, it was very bright! One of the last anvil crawler style bolts of the evening, just before midnight; the last one was massive (there was about 5 minutes between it and the previous) and it was so bright and long that I moved the camera (I have to admit I was getting tired and it startled me) and the picture was blurred/jittery. Close-up of the previous shot (lower right) showing three upward streamers, the right most one got the return strike but was a bit off from the original streamer (or there were 4). If only we could harness that…looks like it almost tapped us! 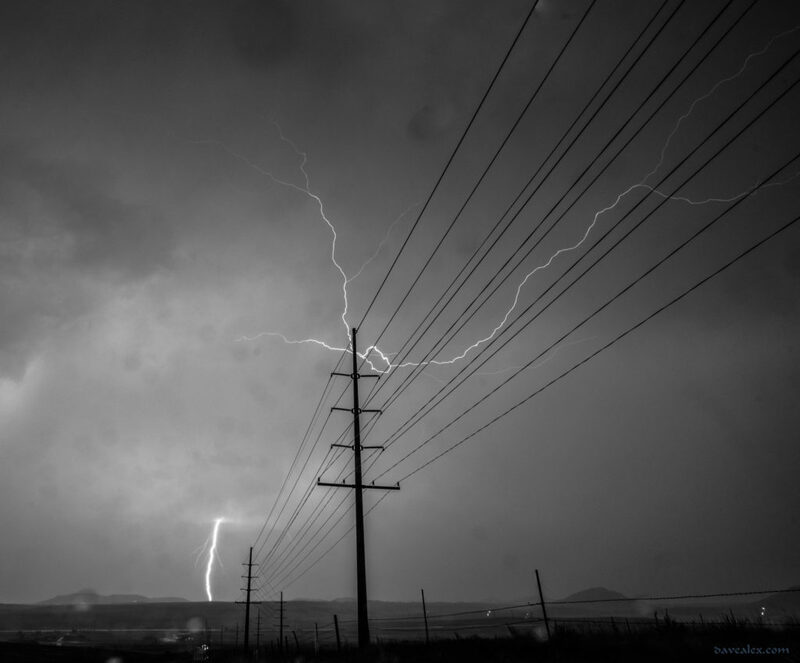 Cool black and white shot, south Douglas County Colorado, Aug 28th about 11:30pm.